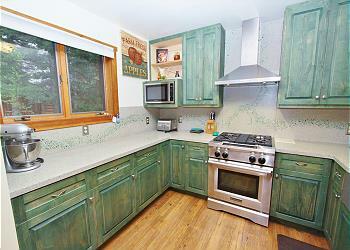 Wooded location with beautiful summer gardens and outdoor space to enjoy. New for 2019- Upgrades inside and out along with a hot tub! 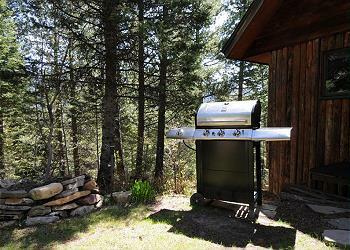 BRIEF DESCRIPTION Bridger Mountain Cabin is a rustic and charming retreat with all the comforts of home. Enjoy a beautiful forest location, plenty of wildlife viewing and a convenient location; 20 minutes from Bozeman. The cabin is approximately 1300 square feet on two levels. BEDROOMS AND BATHS There are two bedrooms upstairs, one has a king size bed and the other has two queen beds. 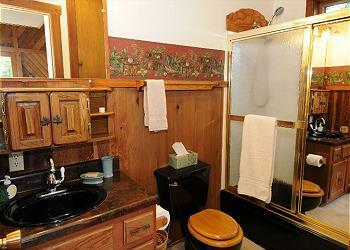 There is one full bath with just a stall shower upstairs to be shared by the two bedrooms. The laundry facilities are located in the upstairs bathroom. There is a second full bath with tub and shower on the main floor. KITCHEN The home has a bright sunny kitchen which has been recently remodeled with all new appliances. There is an gas range and convection/electric oven, dishwasher, microwave, coffee maker, mixer, toaster and all new cookware and serving ware. DINING AREA AND LIVING ROOM There is a large dining table which seats six comfortably on the edge of the living room, just off the kitchen. The comfy (and long!) leather sofa and chairs are situated around the gas fired "woodstove" - a perfect place to relax after a long day of exploring the outdoors. There is a television with DVD player and satellite service. There is no stereo at this time but there are music stations on the satellite TV service. 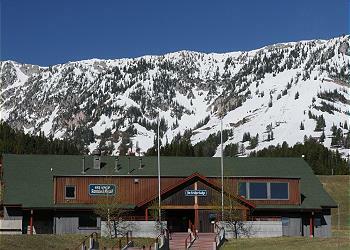 SETTING, VIEWS AND OUTDOOR AMENITIES The home is located at Bridger Bowl ski area. It sits on a wooded, hillside location among a couple other homes in the woods. The winter access to the cabin is up a fairly long set of stairs from the parking area. In the summer, guests can drive to and park in the driveway by the cabin. There is a deck that wraps around the cabin, just big enough to set a few chairs out there and do some stargazing. There is also a hot tub, nice lawn space, some outdoor seating, and a gas grill among the trees for a barbecue. Enjoy the flower gardens! CLOSEST TOWN AND AIRPORT It's about 18 miles to Bozeman and the 25 miles to Bozeman's Yellowstone International airport. ACTIVITIES NEARBY Besides hiking and mountain biking on nearby trails, there is fishing, horseback riding, golf, and everything that the town of Bozeman has to offer. Yellowstone National Park is only an hour and a half away. We enjoyed our stay at the Bridger Mountain home. The kitchen was well-equiped and the cabin very clean. Though it was next door to other cabins, it was quite "private" and quiet. The deck around the cabin was great for stargazing and relaxing after our trip to the Lewis & Clark Caverns. Not within the town proper but close enough to stock up on groceries and gas along with a variety or restaurants in Bozeman. We would return in a heartbeat! We enjoyed our vacation to Bridger Bowl very much. The scenery was peaceful and relaxing, the home perfect for our needs. Location very good for sight-seeing. Mountain Home Rentals was a true blessing to find. The Mountain Home Vacation Rentals experience couldn't have been better. The pre & post reservation info was clear and precise. The description of the property is spot on. The home is perfect for a small family or couple and provides all the comforts for those who ski and those that just relax. This is a true ski in/out. In a nutshell...the cabin and area is very relaxing and quiet and perfect those wanting peace and quiet with an exquisite view. Oh...yeah the skiing is phenomenal! My husband, our 2 children and myself met my brother and his 2 kids for a 4 day stay over spring break. This was an amazing cabin and such a peaceful location. We had tons of room - it was amazing! We are hoping to be able to do this again next year and I would definitely try to get this same place if it is available. Thank you for making this cabin available - the memories will never be forgotten! My dad, brother, and I rented the cabin for a 5-night stay in the Bozeman area. Although we spent most of our time on the stream fly fishing, the cabin was a welcome reprieve. It was a 15-20 minute drive from Bozeman. The cabin was spotless and had everything we needed. It was quiet and comfortable, and nothing compares to drinking a cup of coffee on the front balcony in the morning. Mountain Home Rental Company was prompt, exceptionally accommodating, and reliable. I definitely recommend the company and this cabin! 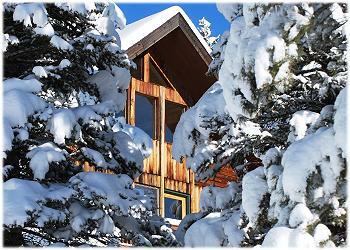 Thank you for your great review of Bridger Mountain Cabin and Mountain Home Vacation Rentals! We are glad you enjoyed Bozeman and the surrounding area and that the cabin had everything you needed to relax at the end of each day! We love hearing that our guests thoroughly enjoyed one of our properties. Let us know when you start to plan your next trip. We would love to have you as our guests again! Tricky to find, but with rustic charm, albeit requiring a little maintenance. This would be a great cabin in the ski season as it is walking distance from the bottom of the chair lifts at Bridger Bowl. Bozeman and the surrounding area is great. 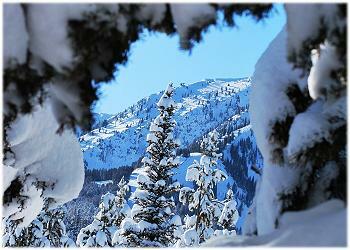 If I were a skier, I would definitely return to rent Bridger Mountain Cabin because it is right next to Bridger Bowl. You could literally ski from your cabin to the slopes. We rented it during the summer and it was also a great summer cabin. The windows were huge and the property is surrounded by pine trees. A deer came near the window one day and we saw small rabbits and chipmunks, but no other wildlife. 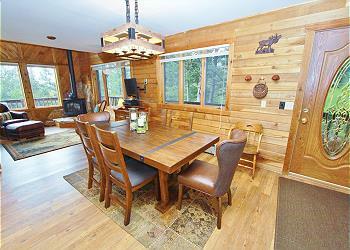 The cabin is extremely well furnished and supplied. The kitchen had everything you could possibly need. It was nice having a washer-dryer as well. The first day the wifi was not working but the property management company sent someone to the cabin the next day to fix it. The porch is very small and could use some TLC as well as better porch furniture (just had a small rusty table and worn bench). The greatest disappointment was that four of the seven days there was a bulldozer doing work near the slopes so that spoiled the tranquility we were looking forward to. Still, I highly recommend the cabin to others looking for a Montana experience. The 15 mile drive from Bozeman to the cabin was gorgeous and we hiked several of the trails recommended by the property management company. Thank you for your review of Bridger Mountain Cabin! We are glad you enjoyed the property and had all you needed during your stay. We are so sorry there was work being done on the neighboring resort property that interrupted the peace and quiet of the area. We hope you are able to return to the area and we would love to help find the perfect place for your next getaway. Thanks again!